I love rainy spring days. Wellington's wet winters usually get the better of me, and I'm often yearning for sun, but once spring rolls around the grey, melancholy drizzle outside feels just right. Perfect for curling up with a book, or throwing on a raincoat and going for a purposeful walk in the rain, or eating rich, warm comfort food. (Of course it helps if the wind isn't blowing, and if it follows a string of warm, sunny days). And now that winter is receding, I want to hold on to those last vestiges of seasons past. It was in this frame of mind that E and I put on our raincoats and headed out for a wander along Courtenay Place. We were hungry, but it was past 3pm and all that was open was fast food restaurants or little Asian joints. Wanting to try something new, we settled on Momo Tea. Its well-lit interior, with colourful green and yellow chairs and almost-stark fluorescent lighting provided a cheery contrast to the dull grey outside. It seems as though half the menu is made up of different drink options - mainly various fruity flavours of bubble-tea drinks ($4.50-$6, though "bubbles", or tapioca pearls, are $1 extra), as well as some juices and interesting options like the lychee yogurt drink ($5.5o), which E ordered. It was refreshing, sweet, and just a bit sour from the "yogurt" flavour - I'm guessing whatever they use is more like Yakult than a thick, creamy yogurt. I ordered a cold sesame milk bubble tea ($7), which looked like it should be a cookies-and-cream milkshake but tasted more like the black sesame ice cream I had at Kazu a while back. I noticed a variety of "toast" options on the menu, including coconut toast ($3). I ordered it, hoping with all my might that it would be something close to kaya toast. It wasn't - it was a thick, fluffy slice of lightly toasted white bread with some kind of gritty coconut-flavoured butter on top. Not altogether unpleasant, though. With all that butter, sugar and refined flour it falls squarely within that semi-sinful category of comfort food. Speaking of comfort food, I ordered the braised pork claypot ($12.90) from the little list of specials. I was sold as soon as I saw the words "braised" and "claypot" in the line - just perfect for a rainy day! Because the menu had just said "pork" I was happily surprised to find that the cut used was pork belly, simmered to a falling-apart state in a sweet, soy-based sauce. It was served with a few pieces of Asian greens (probably to appease the conscience after eating so much melt-in-your-mouth pork fat! ), and a plate of rice on the side. E had an order of the spicy chicken with rice ($11.90). It wasn't really that spicy, but that said, it wasn't totally lacking in heat either. Though plenty oily, it seemed like a more wholesome option, packed full of crisp, stir-fried veggies and chicken. And, as if they had read our rainy-day mood, there was a shelf full of cards and board games. Some of them were Chinese games we didn't know how to play, but there was also a travel-sized Scrabble, perfect for our little table. Service was a little haphazard (E received his entire order, including his main, before I was even served my drink), but the waitress who seemed to be running the entire front of house was lovely and very patient with us as we grappled with the extensive drink menu. 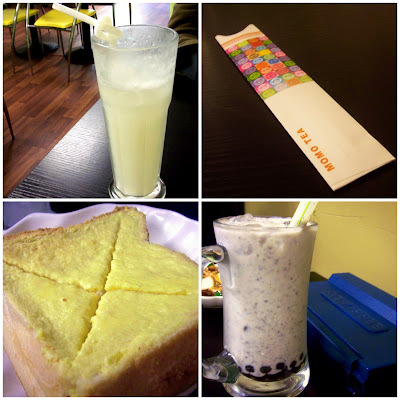 The food was not bad, and the drinks refreshing, though I wondered if $7 for a bubble tea was a bit excessive. Or maybe not - I'm not in Singapore anymore, after all. All up, not bad for a mid-afternoon cheap feed. You can now drink that Bubble Tea with a Glass Bubble Tea Straw! Very elegant! You can find the bubble tea size, just go to glassdharma.com. Aha! Never knew this place served food before. Looks pretty lovely though and I like that they have games available. Am not quite 'at one' with tapioca though. Even the name is a bit depressing. How cool that they have board games. I'm a Scrabble addict on facebook but it's been years since I've played with an actual board. lol! Looks like the perfect uni student hangout and eek $7 for bubble tea is rather pricey! It's the Journey - hmm, I find the idea of a glass straw rather intriguing... I'd be afraid of breaking it! Laura - ha, I'd never even thought about the word 'tapioca' before. Guess it is a bit strange... I wasn't really sure if I liked it before I spent some time in Asia. I've been converted, though! Hmm, I've always meant to pop in there... maybe on my next outing. Haha, no I didn't see that collection, but will deff. check it out!